By PATRICK DOYLE "I'm 86 years old," Chuck Berry said after playing a short, raw set at Cleveland's State Theatre late Saturday night. "And I'm happy to be anywhere!" The crowd was equally ecstatic. Berry traveled to Cleveland for a tribute concert in his honor, which included performers Merle Haggard, Ronnie Hawkins, Darryl "DMC" McDaniels, Joe Bonamassa and Lemmy Kilmister. At the end of the night, Berry accepted the Rock and Roll Hall of Fame's American Masters of Music Award, wrapping the Hall of Fame's weeklong celebration of Berry's life. The reclusive Berry seemed to love every minute of his Cleveland stay, spending Saturday afternoon at the Hall of Fame, where he checked out his exhibit with his family and held a rare interview with journalists in a Hall of Fame conference room, praising President Obama and discussing his health. He was in for some surprises. Whether it was DMC retooling "School Days" as a pro-education hip-hop anthem or Haggard putting a twangy spin on "Memphis," the night highlighted just how far Berry's influence reaches. Between performers, classic Berry performance footage was shown on a massive screen and Rock and Roll Hall of Fame President Terry Stewart put the songs in historical context. "[Berry] was a lightning rod," he said. "Rock & roll was still being born and he came out the way he did. Unbelievable." Setlist-wise, you couldn't go wrong; Berry has one of the greatest catalogs in rock & roll history; vivid, witty storytelling over rollicking rhythm. Seventy-four-year-old Ray Sharpe, who has been recording since the late Fifties, growled a soulful "No Money Down" soaked in Texas twang, backed by the ace house band. Rockabilly revivalist J.D. McPherson howled a loose, chugging "Beautiful Delilah" and bounced across the stage through "Around and Around." "It's ridiculous that I'm here tonight," McPherson said, grinning. The New York Dolls' David Johansen and Earl Slick tore the roof off with a smoky, fuzzed-out take on 1961's "I'm Talking About You" and invited out Ohio's Rick Derringer for a heavy "Back in the U.S.A."
The night rolled on with John Fulbright, who sat at a keyboard and played harmonica on "Downbound Train." Malina Moye played Berry deep cut "Stop and Listen," full of wah-wah and feedback-drenched guitar. The number concluded with Moye by raising her Stratocaster above her head and twirling around in her lengthy dress. It didn't sound anything like Berry, but it made an impression. More fancy fretwork came from Bonamassa, who played a gorgeous, hushed "In the Wee Wee Hours" and a raucous "Oh Carol." Lemmy Kilmister attacked "Bye Bye Johnny" and "Let It Rock" with his whiskey-soaked growl. Sitting backstage sipping a Jack and Coke in his dressing room, Kilmister said Berry was one of his first heroes. "I liked his attitude. He had that sort of smile on his face and that pencil mustache, sort of a lothario, you know. He's always got that innuendo in the vocals when he's talking about chicks. He was always a horn dog, basically, and so was I." At 77, Ronnie Hawkins proved he's still a powerhouse showman with "30 Days" and "Roll Over Beethoven," the Hawk whooping and howling during instrumental breaks. San Antonio rockabilly singer Rosie Flores was one of the most impressive acts of the evening, performing endearing, country-flavored takes on "No Particular Place to Go" and "You Never Can Tell." Flores was also the only performer brave enough to playfully attempt a duck walk. Next to Berry, Merle Haggard was the biggest legend in the room. His set started rocky due to some technical difficulties; there was a pedal board in front of his microphone. "You guys put something in front of me that's not supposed to be here," he said, pointing to the board. "Can you come to move it?" The move made Haggard's guitar short out, and he threw up his arms in frustration. He overcame the problems with his classic "Workin' Man Blues," grinning genuinely at his son Benion's tasteful Telecaster mastery. Next, the duo played a raw "Memphis," Haggard rattling off Berry's lyrics with his axe slung across his back. "It's great to be part of the fanbase of the great Chuck Berry," Haggard said. "Its even better to be asked to play here." Next, Ernie Isley played a heavy version of "Rock & Roll Music" while McDaniels took one of the night's biggest risks, performing his own version of "School Days" backed by a DJ and the house band. "Chuck Berry's been rapping before rappers been rap!" McDaniels said in a speech; DMC and Ernie Isley soon mashed rock and hip-hop, sampling Berry's vocals in their own take on "Brown Eyed Handsome Man." At the end of the night, Stewart announced "the man of the hour" and the curtain rose, as Berry stood onstage with his band to a massive standing ovation. He kicked straight into "Johnny B. Goode" before getting lost for a moment, while his daughter Ingrid sang the lyrics. He soon joined back in and the song picked up steam. "What's the second song?" he asked the band afterward. He kicked into "Reeling and Rockin'" to huge applause, but soon raised his hand and stopped the song, then eased into it again with the rhythm a little slower. 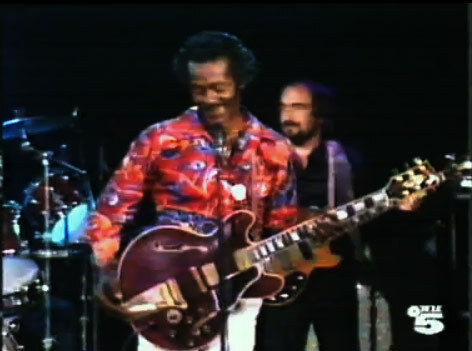 Berry was full of energy, hitting stellar double-string licks, duck-walking and holding his Gibson high in the air above the piano with a twinkle in his eyes. The night finished up when Berry graciously accepted the Hall of Fame's award, and, in a rare move, invited his wife onstage. "Ladies and gentlemen, Themetta Berry, my wife of 62 years," he said. "It's going to be 63 in June!" Most of the night's performers returned to the stage for "Rock & Roll Music," a fun mess that was led by Isley as Berry returned to the stage halfway through the song, playing rhythm next to Lemmy Kilmister and high-fiving the Motörhead singer. Earlier in the day, Berry told Rolling Stone that his singing days have passed. But, true to character, he's still full of surprises. By Kevin C. Johnson kjohnson@post-dispatch.com 314-340-8191 The Rock and Roll Hall of Fame and Museum in Cleveland will honor a St. Louis icon when it gives Chuck Berry a weeklong spotlight. “Roll Over Beethoven: The Life and Music of Chuck Berry,” part of the museum’s American Music Masters Series, kicks off today and ends Saturday with a concert in Berry’s honor. The American Music Masters Series, in its 17th year, honors a prior Rock and Roll Hall of Fame inductee each year. Honorees have included Woody Guthrie, Aretha Franklin, Muddy Waters, Hank Williams, Jerry Lee Lewis, Bessie Smith and Buddy Holly. Berry, a St. Louis native and Grammy Lifetime Achievement Award recipient, was inducted into the hall in 1986. Charles Berry Jr., a guitarist in his father’s band, is also proud. “It puts hair on a bald chest,” he said. Lauren Onkey, vice president of education and public programs for the Rock Hall, said the American Music Masters Series presents an opportunity to explore the careers of its inducted artists who were key to the development of rock ’n’ roll and have changed the landscape of music. Onkey said Berry had been discussed as an honoree for a while. Berry worked with the Rock Hall last year on an oral history interview for its archives. “It’s a story we always wanted to tell, so we said, ‘Let’s go for it,’” Onkey said. Writer-musician Greg Tate, a founding member of the Black Rock Coalition, said music wouldn’t be music as we know it without Berry. Tate is delivering a keynote lecture this week at the American Music Masters Series. 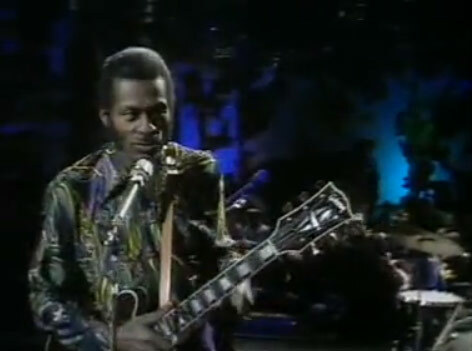 Tate called Berry’s “Johnny B. Goode” a breakout moment in the history of music. Guitarist Ernie Isley, a 1992 Rock Hall inductee with the Isley Brothers, has never worked with Berry, but he said he quickly agreed when asked to perform in Saturday’s tribute concert in Cleveland. Isley, who also lives in St. Louis, said he was inspired by Berry’s talents as a teenager. Blues-rock guitarist and singer Joe Bonamassa bought a Gibson guitar like Berry’s a long time ago. And rockabilly artist Rosie Flores said anyone who has ever played a guitar has to name Berry as an influence. Events to celebrate Berry this week in Cleveland also include a conference on his career and influence on rock ’n’ roll, a screening of “Hail! Hail! Rock ’n’ Roll” and programming for students. Two new Berry exhibitions also are open, featuring items such as his stage clothing, a guitar and an early recording contract. Most of the events will stream live at rockhall.com. Berry will accept the American Music Masters Award on Saturday at a concert that features Isley, Bonamassa and Flores, plus Merle Haggard, Darryl “DMC” McDaniels, Vernon Reid, Duke Robillard, Ronnie Hawkins and others. 05 Noah_ And the NeighborBy Rolling Stone Recently, Chuck Berry made a rare move: he gave an interview. Visiting Cleveland to accept the Rock and Roll Hall of Fame’s American Music Masters Award, the 86-year-old met with journalists at the museum’s offices before touring an exhibit celebrating his life. Seated in the center of a conference table between friend Joe Edwards and his son Charles Berry Jr., wearing a captain's hat and a Rock and Roll Hall of Fame varsity jacket, Berry was humble, revealing and playful. "Now let me make a statement," he said at the beginning. "After being before drums for 48 years, it has taken effect in the last four months and I have a strange hiccup that comes out every time I tell the truth." The room erupted in laughter. At one point, Rolling Stone asked Berry how far the country has come since the days he played segregated venues throughout the South. Berry paused for a moment. "I never thought that a man with the qualities, features, and all that (President Obama) has, [could] be our President," he said. "My dad said, 'You may not live to see that day,' and I believed him. I thank God that I have." Berry stopped for several seconds while his eyes welled up. "Excuse me," he said. The most moving moment came when Berry discussed his own future. Explaining that he doesn't hear well, Berry turned to his friend Edwards. "If you don’t mind, Joe, explaining [questions] to me, because I am hearing very little. I’m wondering about my future," he said, raising his finger. "That’s news!" Berry was asked to expand. "Well, I’ll give you a little piece of poetry," he said. "Give you a song? I can’t do that. My singing days have passed. My voice is gone. My throat is worn. And my lungs are going fast. I think that explains it." St. Louis Post-Dispatch writer Kevin C. Johnson argued that people still pay to see Berry monthly at St. Louis’ Blueberry Hill. "I’ll tell you what that is," Berry said. "They’re having a great time from memory. And I hope that I can continue to enhance their memory because it looks very dim, like I said, you know."